Margaret has been heavily involved in bridge at county and national level of sixty years. She served on the EBU Board from 1959 to 2000, acting as Vice Chairman from 1984 to 1989. She was also a member of the Tournament Committee from 1989 to 2013, twice serving as Chairman (1990 to 1995 and 2002 to 2005). Margaret was part of a small committee which proposed the introduction of the Dimmie Fleming Award, and is still a member of the committee which considers the candidates proposed by the counties. She has been part of committees which have organised the European and World Championships held in England - in 1985, 1987, 1989 and 2002. She received the Gold Award for her services to English Bridge in 2000, and became a Vice President in 2004. In addition to her work with the EBU, Margaret served on the Executive Committee of the British bridge League, and also served as Chairman of its Tournament Committee from 1996 to 2001. 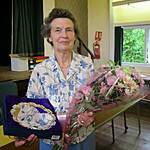 She served as Honorary General Secretary of Essex CBA from 1956 to 2011, and then assumed the role of Honorary President. She has attended EBU Council and Shareholders' meetings on behalf of Essex from 1957 to the present day, as was also the organiser of the Eastern Counties League for many years. As well as being a successful administrator, Margaret has also done well at the bridge table, including victories in the Seniors Congress Teams, Year End Swiss Pairs, and Ladies Pairs. Amazingly she has also found time to pursue other pastimes to a high level, having played Netball for England in the World Championships, and serving as President of the Essex County Netball Association.